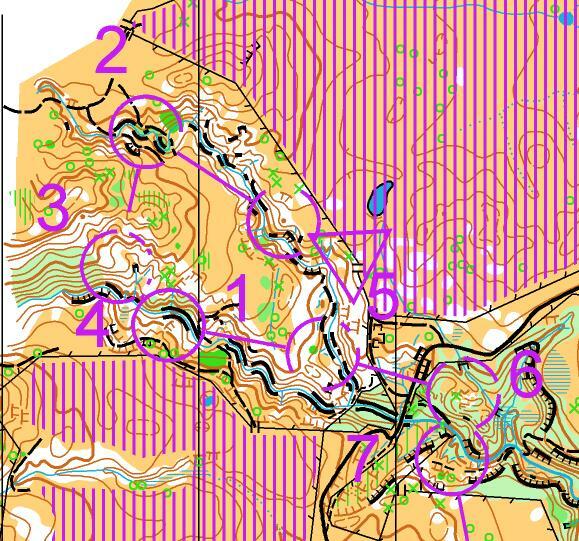 Devon Beckman and Dani Goodall have drawn first blood in the pursuit for selection for JWOC2016 in Switzerland. Although trailling at the split time control, Devon has a comfortable 2 minute margin over Ed Cory-Wright with Shamus Morrison and Matt Goodall close together in 3rd and 4th. On Derek Morrison’s technical an dphysical course through the gorges of Smedley Station, Dani’s winning margin was a whopping10 and half minutes ahead of Alice Tilley in 2nd, with Sophie Harrison, despite being delayed at Christchurch airport for 2 hours by fog, in 3rd. The tough nature of the courses was shown by Dani being the only girl under an hour and well outside the recommended winning time. The women’s course is shown on the left. Men: 1. Devon Beckman (HB) 37-17, 2. Ed Cory-Wright (PAPO) 39-20, 3. Shamus Morrison (W) 42-52, 4. Matt Goodall (CM) 42-58, 5. Tommy Hayes (A) 44-57, 6. Stephen Harding (PAPO) 45-28, 7. Cameron de L’Isle (A) 48-26, 8. Ieuan Edmonds (HB) 49-33, 9. Connor Cleary (PAPO) 50-38, 10. David Rawnsley (HB) 53-51. Women: 1. Dani Goodall (CM) 50-34, 2. Alice Tilley (NW) 61-01, 3. Sophie Harrison (PAPO) 63-15, 4. Lara Molloy (W) 64-31, 5. Katie Cory-Wright (PAPO) 67-18, 6. Kayla Fairbairn (NW) 67-28, 7. Carolyne Nel (HB) 72-06, 8. Briana Steven (PAPO) 75-52, 9. Sonia Hollands (CM) 77-20, 10. Jenna Tidswell (HB) 80-16. 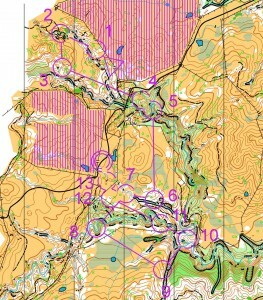 Tomorrows long distance should see much cleaner and faster running although athletes will still need to negotiate the many gorges that cross the area.